Could Dental Implants Solve Your Denture Woes? Traditional dentures have come a long way in past decades. Now, they look more realistic as well as fit more comfortably than ever before. However, despite the updated designs, removable dentures continue to have some setbacks. 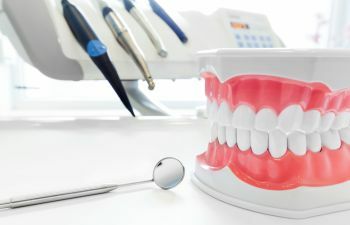 It is common for denture wearers to suffer from ill-fitting dentures or need more frequent relines than they had hoped for. These patients may find themselves hiding their mouth when they laugh or avoiding certain foods for fear that their dentures may slip out of place. Fortunately, there’s a way to solve these denture woes and help patients reclaim a more confident lifestyle. If you are willing to put forth the extra investment, dental implants can be used to permanently anchor your full arch of dentures. Dental implants involve surgically placing a small titanium post into your jawbone. Over time, the implant fuses to the surrounding bone and becomes a strong anchor for your denture or partial on top. Dental implants act much like a tooth root, which stimulates the underlying bone and helps you retain density and structure in your jawbone – this can affect the way your face looks on the outside! Don’t worry, you won’t need several dental implants to secure your dentures. Many of the latest systems only require two to four implants to support a full denture. Best of all, you won’t have to worry about your dentures slipping out of place while you eat, speak or laugh. Implants can be a long-term investment towards your quality of life! Gold Hill Dentistry proudly offers a full menu of solutions in restorative dentistry, including dentures, partials and dental implants. If you are struggling to find satisfaction and comfort in your removable dentures, please let us know so that we can explain your options in implant dentistry. Your smile is always worth the investment!